Gene-regulating microRNAs in the brain are under the influence of microbes in the gut, according to new research. Disruption of these microRNAs may increase anxiety and fear-related behavior. Studies in animals are helping reveal how the microbes that live in our guts can affect our emotions. According to research reported August 25, 2017, in the journal Microbiome, dozens of gene-regulating molecules called microRNAs in the brain are under the microbes’ influence. Wiping out these microbial communities disrupts microRNA levels in brain regions involved in fear processing, which in turn may alter the development of neural circuits or change neuronal function. Trillions of microbes live in our bodies and on our skin, and scientists are just beginning to explore how these constant companions—collectively referred to as our microbiome—influence human health. Growing evidence suggests microbes have important impacts on the brain, and that disruption of the microbiome in the gut can contribute to psychiatric illness. 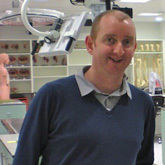 In the new study, researchers at the APC Microbiome Institute led by 2013 Foundation Young Investigator Gerard Clarke, Ph.D., a lecturer in the Department of Psychiatry and Neurobehavioural Science at University College Cork in Ireland, explored the impact of the gut microbiome on two parts of the brain involved in detecting and responding to fearful stimuli—the prefrontal cortex and the amygdala. Microbes may well be involved in other brain functions, which were not explored in this study. Researchers have found that when mice are raised in a sterile environment without any microbes, they exhibit less anxiety-like behaviors than animals that coexist with the usual bacteria, viruses, and fungi. This is not to suggest that anyone – mentally healthy or affected by a disorder -- can live without microbial “guests.” Rather, it suggests that microbes, and the genes that regulate them, do have an impact on operations of the brain that are involved in brain functions – in this case, the response to the perception of fearful stimuli in the environment. Dr. Clarke and his colleagues Professor John F. Cryan and Dr. Alan Hoban have detected changes in gene activity in the prefrontal cortex and the amygdala in microbe-free mice, which they say might underlie the animals’ altered expression of fear and anxiety-like behaviors. Their newest work suggests that microRNAs, whose levels are altered in both the prefrontal cortex and the amygdala when animals’ microbiomes are absent or depleted, might be involved in regulating these changes. The researchers found that they could restore normal levels of certain microRNAs by introducing microbes back into the animals’ systems. Some microRNAs did not register, even after animals were exposed to an environment full of microbes – the environment we all live in. They say this suggests there may be a window of time early in life when the microbes’ presence is crucial for brain development.